Rumors of an iPad Mini 5 have been circulating for years, but only now finally has a new Mini arrived, making for the first update to the miniature iPad line since 2015. If you're a fan of the 7.9-inch screen tablet from Apple, you're going to be overjoyed with the top-end spec that the company has included on its latest small screen slate. 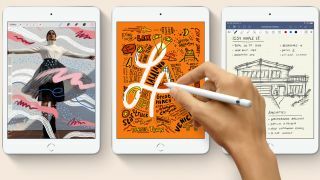 Launched alongside the new iPad Air, the company has included some features usually reserved for more premium tablets, giving you them in a smaller size for the first time. The new iPad Mini was announced on March 18, 2019 and you can pre-order it right now. You won't be able to get it in your hands until some point "next week", according to Apple. We take that to mean any point between March 25 and March 29. Considering the company's usual tendency to release its products on a Friday, we'd expect you to be able to pick the new Mini up from a store or find it delivered at your house come March 29. The iPad Mini may be smaller than the competition, but it's not the cheapest iPad you can buy - that honor goes to the iPad 9.7 (2018) which starts at $329 (£319, AU$469). The new iPad Mini starts at $399 / £399 / AU$599 / AED 1,599 for a 64GB Wi-Fi-only version. The top-end model is quite a lot more at $679 / £669 / AU$1019 / AED 2,729. That version comes with 256GB of storage and a cellular connection. If you've used an iPad Mini before, you'll know a lot of how the design works here. It's a similar size to previous models at 203 x 135 x 6.1mm. If you're opting for the Wi-Fi-only model you'll find it weighs 300g, and it's up to 308g for the cellular version. There's a relatively thick bezel around the outside of the display - unlike on the latest iPad Pro range - so the company has found space to include a Touch ID fingerprint scanner and a selfie camera too. There's no Face ID unlocking here, so instead you'll be using your finger or thumb to unlock it if you want biometric security. At the bottom edge of the tablet you'll find two speakers - these are stereo - and between them is a Lightning cable connector for data transfer and charging up your tablet's battery. That's notable as the company used a USB-C connector for the latest series of iPad Pro models. On the right hand edge, you'll find volume buttons, along with a SIM tray if you've gone for a cellular version of the tablet. You've got three colors to choose from for the new iPad Mini, namely Silver, Space Gray and Gold. Overall, if you're looking for a smaller tablet from Apple this is going to be the choice for you. The design is fairly similar to what you got with the iPad Mini 4, but when you dive into its features you'll find a very different tablet. This is a miniature iPad, so you're getting a smaller screen than the company offers on its Pro range of slates. It's a 7.9-inch Retina Display with a resolution of 2048 x 1536. It's a True Tone display that can reach up to 500 nits of brightness. This should be a screen that rivals the other iPads in Apple's range, especially considering it has 326 pixels per inch. The tablet also supports Apple's stylus, and this is the first small screen tablet from the company to do that. It will only support the original Apple Pencil though, not the company's latest wireless charging stylus. The new iPad Mini comes with an 8MP f/2.4 aperture rear camera while the front camera is a little less high spec with a 7MP f/2.2 rating. We don't yet know the exact battery size. Apple never usually unveils these specs, but the company has said it thinks the battery will last 10 hours of "surﬁng the web on Wi‑Fi, watching video, or listening to music". We won't know what size cell Apple has opted for until someone manages to get a hold of one of these and breaks it open to see what's inside. This comes running iOS 12 software right out of the box, and we can almost gurantee it will support iOS 13 when that launches later in 2019. You should get continued support for Apple updates over the next couple of years, if the company sticks to its normal release routine. You'll also be able to use the Apple Pencil with a variety of apps you can directly download from the App Store, which is something unavailable on previous iPad Mini models. The chipset that's powering the iPhone XS, iPhone XS Max and iPhone XR is also inside here. It's called the A12 Bionic chip, and it's sure to offer top-end power that will be far more impressive than the iPad 9.7 from last year. We don't know how much RAM there is in the new iPad Mini, but we'll be sure to update this when we find out. In terms of storage, you'll have the choice of either 64GB or 256GB. Apple doesn't offer microSD support so whatever you choose here you'll be stuck with it. There are both Wi-Fi only models and cellular versions of the iPad Mini to choose from too.